Heat oven to 350°F. Place paper baking cup in each of 22 regular-size muffin cups. In small bowl, dissolve 2 teaspoons coffee granules in 1 tablespoon boiling water; set aside to cool. In another small bowl, mix flour, baking soda and 1/2 teaspoon salt; set aside. In large bowl, beat 1/2 cup butter and 1 1/2 cups granulated sugar with electric mixer on high speed about 2 minutes. Beat in mashed bananas and 1 teaspoon vanilla. Beat 30 seconds. Add eggs; beat on high speed 1 minute, scraping sides of bowl frequently. On low speed, add flour mixture, about one-third at a time, and sour cream, about half at a time, beating just until combined. Stir in cooled coffee mixture. Bake 22 to 25 minutes or until toothpick inserted in center comes out clean. Cool 5 minutes. Remove cupcakes from pans; place on cooling racks. Cool completely, about 30 minutes. Meanwhile, in 1-quart heavy saucepan, heat 1/2 cup granulated sugar and 2 tablespoons water over medium heat, swirling saucepan until sugar is dissolved. Increase heat to high; cover and boil 2 minutes. Uncover; continue boiling until sugar is dark amber in color. Remove from heat. Beat in 1/4 cup butter with whisk until smooth. Beat in 1/4 cup whipping cream. When cream is thoroughly mixed in, beat in 1 teaspoon vanilla and 1/8 teaspoon salt with whisk. Cool completely, about 30 minutes. In small microwavable bowl, microwave milk on High 40 seconds or just until it begins to boil. Stir in 2 tablespoons plus 1 teaspoon coffee granules until dissolved; set aside to cool. In medium bowl, beat 1/2 cup butter and 1/2 cup of the powdered sugar with electric mixer on low speed until blended. Gradually beat in remaining 3 1/4 cups powdered sugar. Add half of the milk mixture; beat on high speed. Add remaining milk mixture, beating until smooth. Using melon baller, scoop out center of each cupcake, scooping almost to bottom of cupcake. Spoon 1 generous teaspoon caramel filling into each hole. Reserve remaining caramel filling for garnish. Frost cupcakes with coffee frosting. 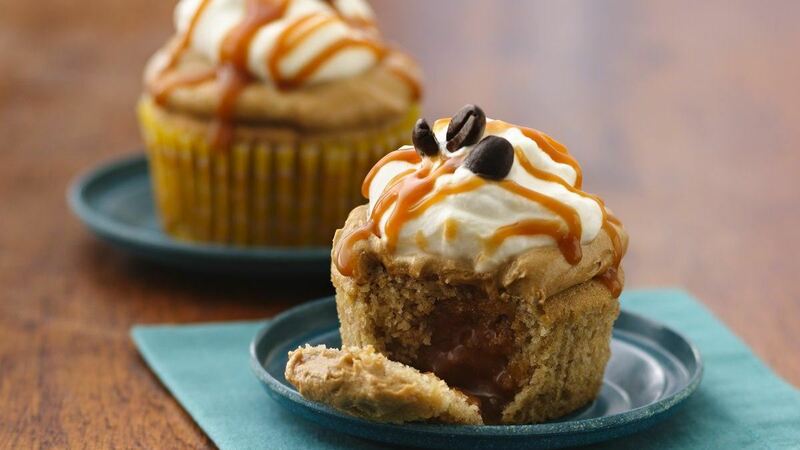 Top with whipped cream; drizzle with reserved caramel filling. Garnish with coffee beans.